Enrollment for the Washington Health Benefit Exchange begins Wednesday, Nov. 1. State and King County employees and agencies are working against national trends to try to increase the number of people becoming insured. A summer assault on the Affordable Care Act by the Trump administration and Congress has confused consumers as annual enrollment for the health-insurance program opens Wednesday. “Every year is a challenge, and this year we have a unique set of challenges,” said Michael Marchand, chief marketing officer and spokesman for the Washington Health Benefit Exchange, which runs the state’s health-insurance marketplace. Even in more certain times, the Affordable Care Act (ACA) and the patchwork of rules and mandates from state to state can overwhelm customers. The recent actions by Congress and the Trump administration, such as repeal attempts, rule changes and executive orders, are making shopping for health insurance all the more perplexing. Washington is one of 11 states operating its own marketplace. Because of this, state officials have set a longer enrollment period, from Nov. 1 to Jan. 15. In contrast, states that use the federal government’s marketplace through Healthcare.gov have an enrollment period from Nov. 1 to Dec. 15, half as long as last year. 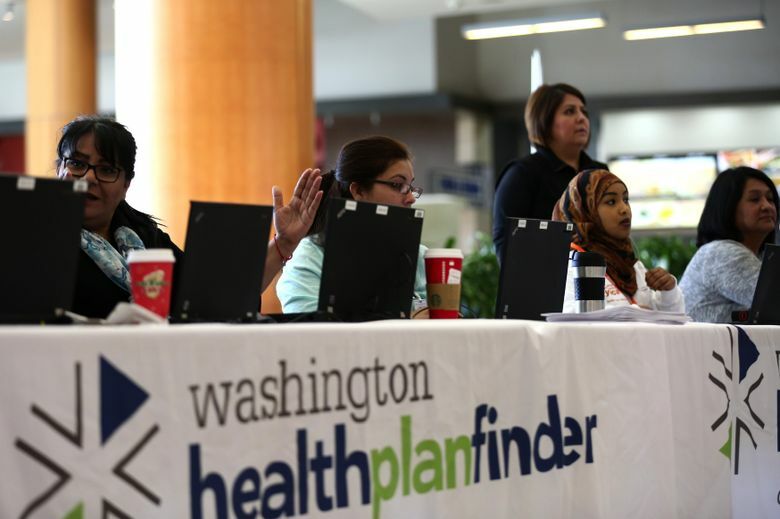 Customers in Washington can find and compare plans and sign up for coverage on the Washington Healthplanfinder website. 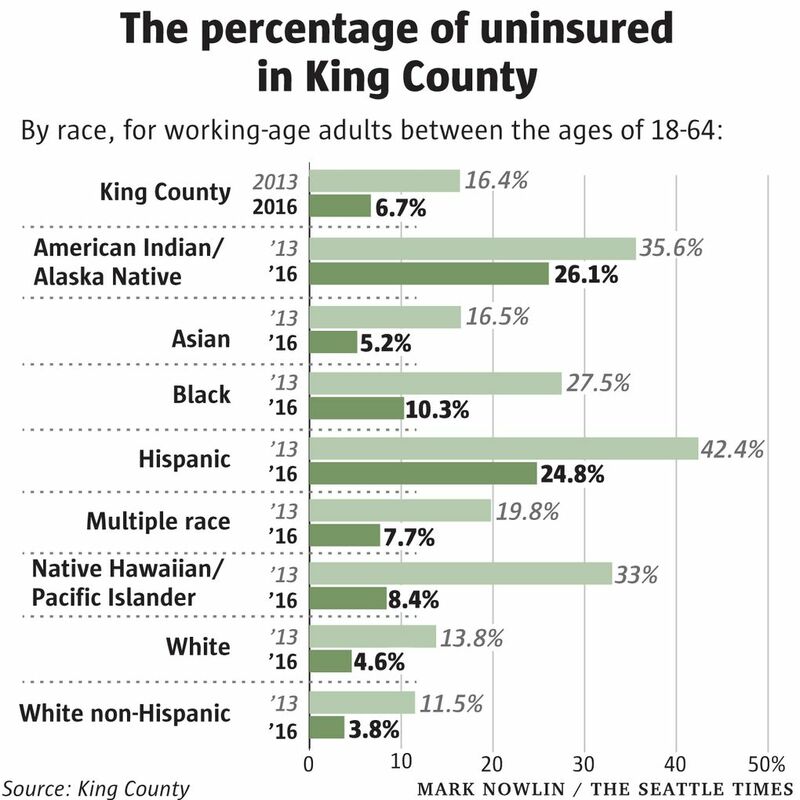 Navigators, the term used to describe outreach groups in the ACA, are fanning out across King County and the state to try to get the uninsured in the system and assist those with insurance who need help re-evaluating their plan options. When the ACA started in 2013, the county’s public-health agency was made a lead Navigator. That allowed it to head up the coordination of 35 agencies with 240 people, which include organizations like Swedish Medical Center and the Center for MultiCultural Health. The mission is to use data and leverage relationships built by county partner agencies to find where and who the uninsured are in the county. The under-served ZIP codes the Navigators focus on mostly consist of communities of color, said Daphne Pie, Public Health — Seattle & King County’s program manager for community health services. One of the ways Pie and her colleagues reach new customers is at enrollment locations. Beginning Wednesday, county staff will be on hand to help first-time buyers figure out which plan is best for them and assist existing customers with any changes. The work by Pie and Navigator groups has helped reduce uninsured 18- to 64-year-olds in King County from 16.4 percent in 2013 to 6.7 percent in 2016. The shrinking number of uninsured cuts across all races in the county. The nonpartisan Congressional Budget Office estimates that nationally, enrollment could decrease by about 11 million people because of the uncertainty surrounding the ACA. Marchand said Washington is actually expecting an increase in sign-ups, with a projected 13 percent bump over the previous year. Some 180,000 people use the state’s exchange, with the bulk of Washingtonians receiving health insurance through work. Another 151,000 buy insurance on the individual market outside the exchange, and an estimated 300,000 to 350,000 buy from health associations. The ACA challenges Marchand refers to have come rapid-fire since President Donald Trump took office. The battle for the future of the ACA heated up during the summer as Congress tried and failed twice to repeal the law, also known as Obamacare, and replace it with a new system. The advertising budget for the ACA was slashed from $100 million to $10 million in August. (Washington’s Legislature approved $1.5 million for the 2017 biennium budget for advertising). People going through Healthcare.gov will also find the site is down for maintenance for 12 consecutive hours on all but one Sunday during the enrollment period. Meanwhile, the Navigator program’s funding was cut by 40 percent. Last month, the U.S. Department of Health and Human Services nixed the federal requirement in the ACA that employers and insurers offer birth-control coverage. Days later, Trump signed an executive order easing rules that allow small businesses to get insurance through health associations, which can bypass state mandates and regulations. The most confusion, though, is coming from Trump’s order to halt subsidy payments to insurers from Congress. Marchand said the majority of consumer calls and emails focus on the administration halting the cost-sharing subsidies used only in the Silver Plans to defray out-of-pocket costs. Customers who qualify will still receive the cost-sharing subsidies — federal law requires insurance companies to cover the subsidies if Congress stops the payments. But that doesn’t mean consumers won’t feel some pain. The state insurance commissioner’s office approved a second set of rates when Trump ended the cost-sharing payments. All customers using the Silver Plan will get hit with a premium rate increase of 9 percent to 27 percent, depending on the insurer, because of the loss of federal help. The increases cover the loss of the payments in the Silver Plans where the cost-sharing payments are applied. People making between 138 percent and 250 percent of the federal poverty level receive the subsidies to reduce deductibles and co-payments. Customers of any exchange plan are eligible for a tax credit to help reduce premiums if they earn between 138 percent and 400 percent of the federal poverty level. Washington Sen. Patty Murray and Sen. Lamar Alexander, R-Tenn., have introduced a bill that would restore the cost-saving payments to insurers through 2019. The bipartisan bill would also give states more flexibility regulating health insurance under the ACA. Insurers and state insurance officials across the nation are struggling with the uncertainty swirling around the ACA. Like other states, Washington saw a double-digit increase in average-rates. A study by consulting firm Avalere Health of the states using Healthcare.gov found that the average increase in Silver Plans is 34 percent. Washington state Insurance Commissioner Mike Kreidler and health-care experts say the repeated attempts to repeal the ACA, Trump’s tough talk about doing away with the provision mandating everyone must be insured, and the decision to not continue the cost-sharing payments have directly resulted in the large average-rate increases seen across the nation. Marchand’s focus is on just getting more people covered. Last year, 83 percent of exchange customers signed up by Dec. 15. Marchand wants that number to be in the 90s this year.